In this article, we will demonstrate method by which you can run REPLMON (Replication Monitor – FrondEnd to command line replication admin – repadmin.exe) without installing Window Server 2003 Support tools. Replmon is a powerful Directory Services replication FrontEnd tool which help to visualize the AD Structure,Naming Contexts (Directory Partitions) and much more – in essence, its a much needed tool in order to grasp ADDS replication basics. Using the below shown method, we can run REPLMON across any Windows 5.x or 6.x releases (such as Windows Server 2008/R2, Windows Server 2012/R2 | Windows 7, Windows 8) like a Portable tool. We need to copy REPLMON.exe under %SystemRoot%\System32 for 32 or 64 Bit OS (in order to get REPLMON.exe image under our %PATH%). Click HERE to download Replmon32Bit 7z Archive. 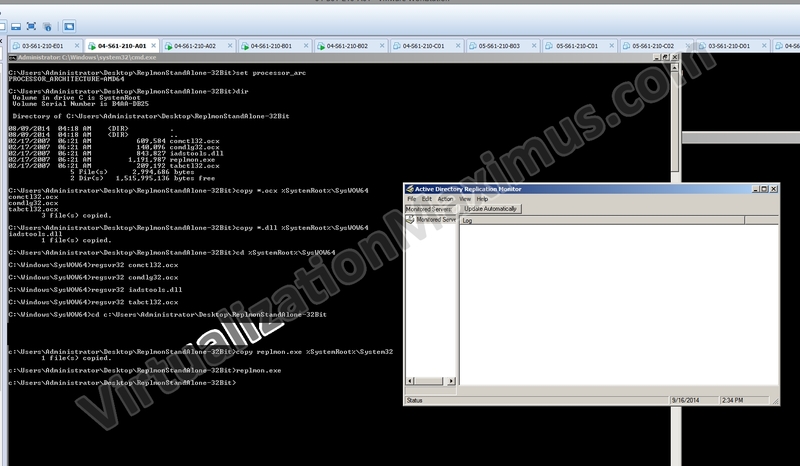 After copying we need to register all of the pasted OCX and DLL files using regsvr32. After registering, we can run replmon straightaway from COMMAND LINE / RUN (i.e. from our %PATH%). Below shown Screenshot shows method adopted for 64 Bit OS in order to run REPLMON. Hope this helps and Cheers | Your feedback is highly appreciated. For copyright purposes, VirtualizationMaximus.com is not in the public domain. The fact that this blog owner publishes an RSS feed does not grant any rights for republication or re-use of the material except in the manner described below. All content in this blog created by the blog owner and his guest authors is the property of the blog owner and his guest authors and protected by international copyright laws and cannot be stored on any retrieval system, reproduced, reposted, displayed, modified or transmitted in any form, electronic or otherwise without written permission of the copyright owner except as noted below. Posted on September 15, 2014, in Active Directory and tagged 2003, 2008, 2012, Portable, R2, Replmon, replmon.exe, server, support, Tools. Bookmark the permalink. Leave a comment.